Please check out my other web site, www.RhodesRulesSchool.com, where I offer several products that can assist golfers to obtain a better understanding of the Rules of Golf. a) I cannot find these exceptions in the 2008-2011- R&A Rules. b) the Local Rule mentions (embedded in) sand, not 'sandy aresa', so it is a factual matter. First, I strongly recommend that you throw away your outdated copy of the Decisions on the Rules of Golf, as it can only cause confusion. Second, I copied the wording of the Local Rule directly from the USGA web site. I can assure you that it is exactly the same reference in the Appendix to the R&A Rules, as the two publications are now completely unified. Check page 127 in the current R&A Rules book. - I checked Decisions 2010-2011; exception 1 was mentioned (page 557); but -remarkably- not in my old Dutch Rules book. So we did not use a Local Rule with exception 1. In the 2012 edition however the text is up to date (I went to my car to check..). - 'a sandy area' is not a sufficient criterium; the question is whether the ball was'embedded in sand' or not. - thick bushes on the ground (see other pictures) made it possible that the ball was somehow embedded in them (not directly in sand itself). - this is factual,and maybe that's why McFee offered Woods to go and see the spot? - but, possibly the bushes are in any case not relevant, because they are growing in sand? so the ball is embedded on top of it. The 'fact' is that Tiger Wood's ball was embedded in sand and no relief was available under the standard Local Rule for embedded balls through the green that is implemented in most tournament events. Of course, Andy McFee knew that it was embedded in sand before he offered to accompany Tiger tback to the location of the incident, as a courtesy. Tiger also knew that it was, which is why he did not need to accept the offer. It was a simple case of not knowing the Rules, resulting in a costly outcome for the player, his caddie (and the Tournament sponsors). You observe in your initial post " Andy McFee determined that the ball was indeed embedded in a sandy area, meaning that TW was not entitled to relief without penalty." I want to suggest, with some trepidation, that with the notable and honourable exception of the USGA's own site's comments on this matter, virtually all other commentators have simply misunderstood the crux of the ruling issue. The crux of the matter is NOT that the ball was embedded in sand. (Let's all agree that it was so embedded). Rather, the crux of the matter is WHERE it was embedded in sand. As you note, the LR in effect on the Tour generally, is clearly written in Appendix 1B, 4a, page 556 in the Decisions book. 1. Rule 25-2 'begins' by affording a player relief from an embedded ball in any 'closely mown area' "through the green". 2. The LR EXTENDS the scope of situations where relief becomes available, to 'ANYWHERE through the green". 3. But, Exception 1 to that LR then qualifies and RESTRICTS the term "anywhere through the green" to exclude balls embedded in sand "in an area that is NOT closely mown" ( my emphasis throughout). If the phrase within Exception 1 ("in an area that is not closely mown") is not to be considered to be superfluous, then we must reason that it is written with the intent of distinguishing between balls embedded " in sand in areas that are not closely mown" and those balls embedded in sand " in an area which is closely mown". The Embedded in Sand + Closely mown area vs. Embedded in Sand + NOT Closely mown area is, in my opinion, what actually is at the heart of AM's ruling; yet it is precisely THAT distinction which virtually all commentators have failed to highlight and focus upon. Your own note above " The 'fact' is that TW's ball was embedded in sand and no relief was available under the standard local rule for embedded balls through the green, that is implemented in most tournament events", is TRUE... but itself fails to identify WHY no relief is available and, perhaps, as with other commentators' pieces on this matter, thus leaves the impression that the 'being embedded in sand' was a sufficient condition to exclude relief; it was not! It was necessary, yes, but not sufficient: the fact that the area was not closely mown is the heart of the matter. Since you may well disagree with me Barry, I would of course love to hear where you may feel I am in error. As per 20-1/0.7 Tiger could have lifted his ball to determine whether he was entitled to relief and if he was not ...then could have replaced it giving his fellow competitors an opportunity to observe this. If he had done that - please confirm that would not be a penalty. I totally accept your statement. Apart from this, a question remains. `..the ball does not necessarily have to touch the soil to be considered embedded, e.g. grass or loose impediments may intervene between the ball and the soil.`(D 25-2/0.5.). Does this not imply the possibility that a ball is embedded without touching the 'sand' ? Whilst everything you say is correct, I think that you are dealing in semantics and I do not agree that my explanation was in any way incomplete, though I certainly agree that many other commentators did get it wrong. In case, anyone has not followed your rationale let me clarify that players may always take relief for a ball that is embedded in sand in the fairway, or other areas cut to fairway length, as per Rule 25-2. In fact, I read the USGA explanation of the incident that you refer to and thought that it might confuse some readers where it says, "The ball was embedded in the sand, but since the ball was embedded in sand in an area which was not 'closely mown', the Local Rule did not apply." The Local Rule certainly did apply, because the ball was embedded 'through the green', but Exception 1 of the Local Rule meant that no relief was available. Again, this is a matter of semantics, but the sentence did confuse me until I thought about it and realised the point John Van der Borght was trying to make. This is exactly what Tiger did. He marked and lifted his ball in the presence of Martin Kaymer to see if the ball was embedded. They both agreed that it was. However, the point is that it did not matter whether the ball was embedded or not. As soon as Tiger touched his ball he incurred a penalty of one stroke under Rule 18-2a. He should then have replaced his ball where it was in the embedded lie. As he did not the penalty was increased for dropping and playing from the wrong place. There is no relief for a ball that is embedded in sand in an area that is not closely mown, unless there is a Local Rule that permits it (and the Local Rule in operation in this tournament did not because of Exception 1). I suppose that it is possible for a ball to be embedded in an area of sand without touching any sand, but in my opinion it is extremely unlikely. However, this has no relevance to the incident in question. Both Tiger and Martin Kaymer agreed that the ball was embedded in sand. --Seeing the location on film and pictures I see only grass, vegetation etc. 'Extremely unlikely'? Not in my opinion. Also, Tiger is quoted as saying: '..we thought the ball to be embedded." He did not say 'embedded in sand'(contrary to your suggestion)." 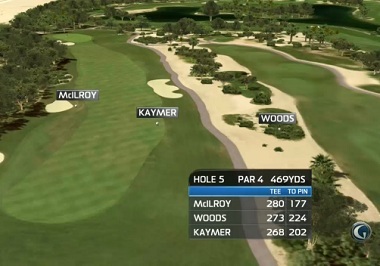 In fact, only Kaymer and Woods have seen the ball's exact lie. Nobody else. Not even McFee himself. --Given the actual- widely accepted and not illogical- ruling, it's not useful speculating further. It is a pity that Woods did not make the cut. The extra attention for the rules, in particular the embedded ball, is a good thing. --Luckily on my homecourse I do not see a spot where a ball could be embedded in grass, weeds or loose impediments, in the middle of a sandy area, not being a hazard.